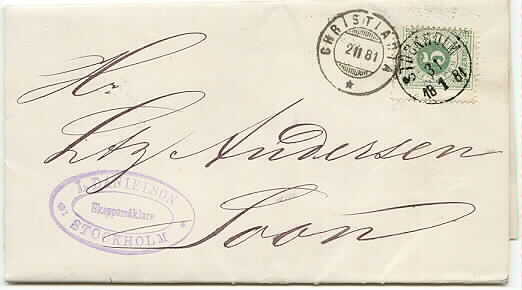 * Stampless cover cancelled "Stockholm 16.2.1852" sent as official letter and free of charge to Skien. Written by Josefine, Queen of Norway and Sweden, to the Consul General Severin Løvenskiold. 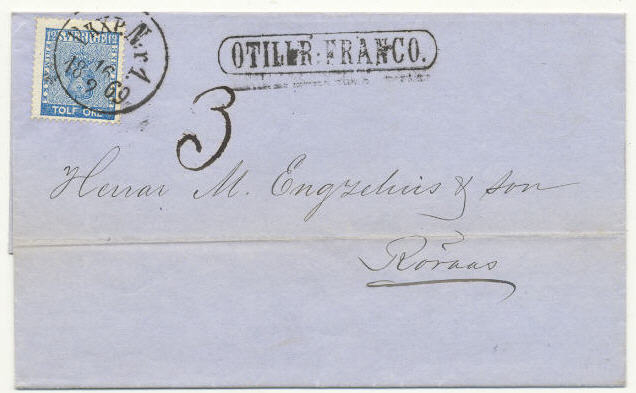 * Facit 4 - 8 skilling Banco - two single copies = 16 skilling cancelled "Stockholm 2.3.1857" on a beautiful double weight cover sent to Christiania. A scarce and unusual exhibition item. 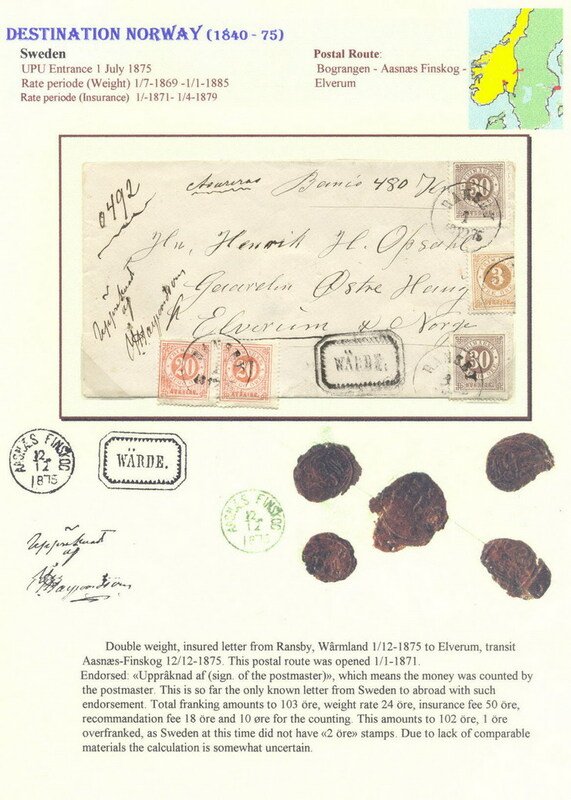 * Facit 7, 9 and 14 B - 5 øre and 12 øre Coat of Arms together with 3 øre Lying Lion = 20 øre nicely cancelled "Falun 12.2.1866" on a colourful single weight cover sent via Kongsvinger to Hamar. 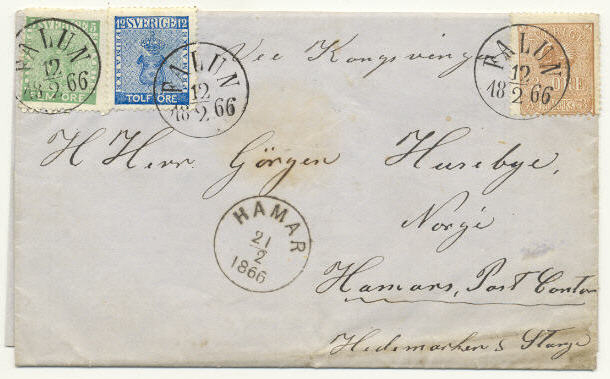 Arrival mark "Hamar 21.2.1866" on the front. A very unusal combination. * Facit 9 - 12 øre Coat of Arms - single copy cancelled "P.K.X.P. 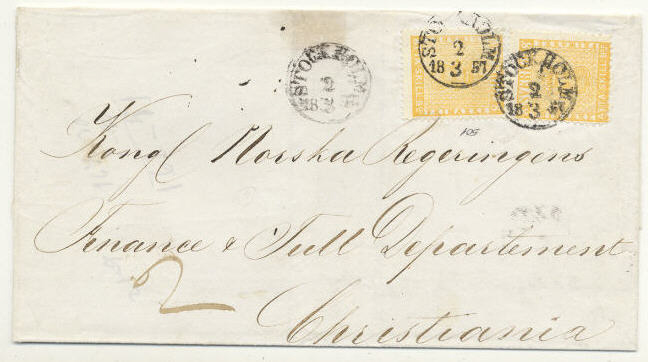 N:r 1 16.2.1869" on insufficiently paid single weight cover sent to Røraas. The rate to Norway in this period was 20 øre = 6 skilling and this cover is underpaid by 8 øre, which is converted to 3 skilling. Postage due "3" is endorsed on front. ogether with cancellation "OTILLR:FRANCO". 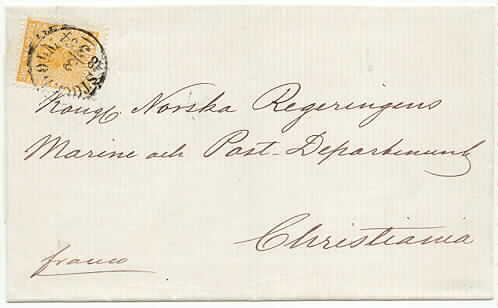 * Facit 9 - 12 øre Coat of Arms - horizontal and vertical pair = 48 øre cancelled "Mora 5.1.1864" on a beautiful double weight cover sent to Røraas. 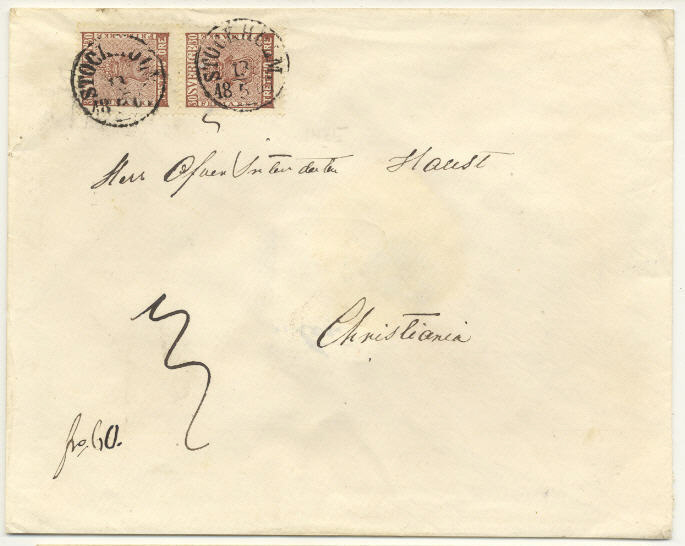 * Facit 9 and 10 - Coat of Arms - single copy of 12 øre and two single copies of 24 øre = 60 øre cancelled "Stockholm 26.9.1867" on a colourful triple weight cover sent to Christiania. 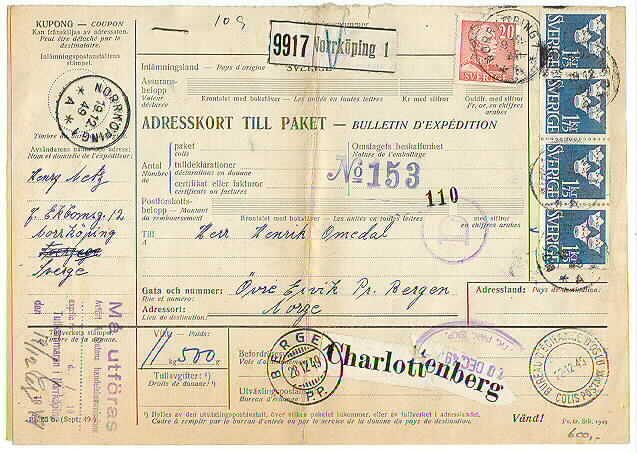 Arrival mark "Christiania Bypost 30.9.1867" on the front. Certificate: H. Obermüller Wil‚n. * 10. 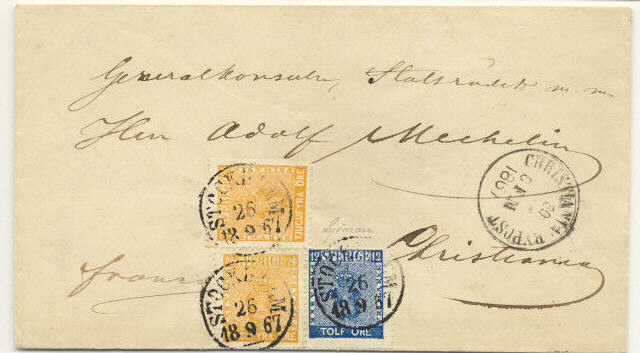 24 øre Coat of Arms - cancelled "Stockholm 3.3.1864" on cover sent to Christiania, Norway. Superb quality. * Facit 11 - 30 øre Coat of Arms - vertical pair = 60 øre cancelled "Stockholm 13.5.1867" on a beautiful triple weight cover sent to Christiania. This is the only cover with this franking to Norway recorded so far. Certificate: H. Obermüller Wil‚n. 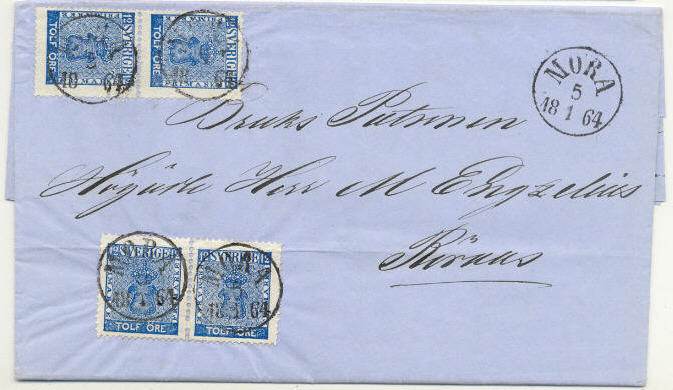 * Facit 17, 22 and 23 - 3 øre, pair of 20 øre and two 30 øre Circle Type = 103 øre cancelled "Ransby 1.12.1875" on a double weight insured cover sent to Elverum.Endorsed "Uppräknad af.." (signature of the postmaster) on the front. This is the only recorded cover from Sweden sent abroad with this endorsement. * Facit 20 - 6 øre Circle type perf. 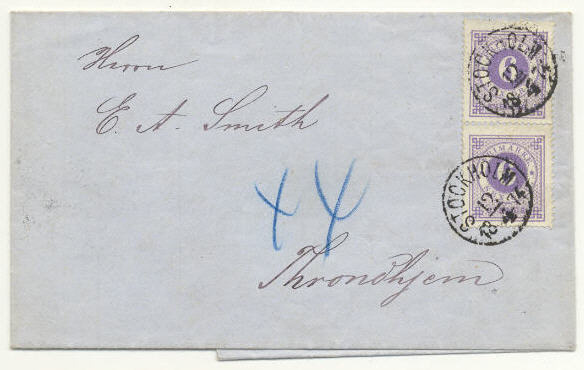 14 - vertical pair = 12 øre cancelled "Stockholm 12.4.1874" on a beautiful single weight cover sent to Throndhjem. * 30. 5 øre Circle type perf 13 - cancelled "Stockholm 31.1.1881" on complete printed matter sent to Soon, Norway. Transit "Christiania 2.II.81" on front. * 281(2) og 332(2) - vannrett par 40 øre Gustav V samt 4+3 sidig par (CB) Stockholms Slott II = 1080 øre - stemplet "Stockholm 24.4.47" på Adressekort sendt til Øvre Ervik ved Bergen, Norge. Påstiftet deklarasjon viser at sendingen har bestått av 1 stk. barnevogn. Loddrett brekk og skade på venstre 40-øre. 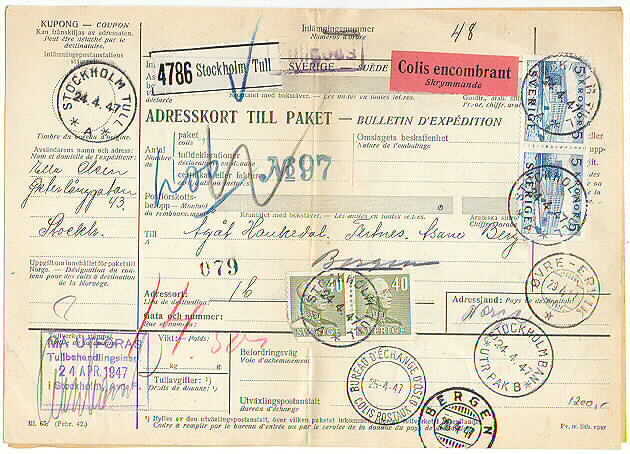 * 286 og 305(4) - 20 øre Gustaf V samt firestripe 1.75 kr Tre Kronor = 720 øre - stemplet "Norrköping 19.12.49" på adressekort sendt til Øvre Ervik ved Bergen, Norge. Loddrett brekk. Påstiftet deklarasjon viser at pakken har inneholdt en kartong Socker-Kakao-frukt med verdi 20 kroner.